We start the Element of the Month program at the start of the school year in September with a discussion of sodium. Sodium is a special case of the Element of the Month program for two reasons. First, the students have not had an opportunity to engage in the Element of the Month program yet or to prepare a poster. The sodium discussion and demonstrations are used as a vehicle to introduce the program to the students. Second, the sodium demonstrations are usually conducted as a follow up to a “first day of school” chemical magic1 show designed to stimulate curiosity and interest. The sodium program is necessarily brief but must be interesting so that it does not appear dull when compared to the chemical magic that was just presented. Typically this is presented to the students not on the first day of school but it is done within the first two weeks. Students will usually immediately respond that sodium is found in salt and seawater. We note that sodium is never found uncombined in nature and we will show why in a few minutes. Students are likely to be unaware that most sodium is to be found in a variety of minerals such as granitic rocks, which contain sodium along with other elements including potassium, aluminum, silicon, and oxygen. It is the weathering of these minerals that releases sodium ions that eventually travel to and accumulate in the sea. Many sodium compounds are valuable industrial commodities, such as sodium hydroxide, sodium carbonate, and sodium bicarbonate. Sodium hydroxide is used in the manufacture of soaps and paper. Sodium carbonate is extensively used in the manufacture of glass and detergents. Many students will offer that sodium chloride is used as a seasoning and also to control ice on roadways. 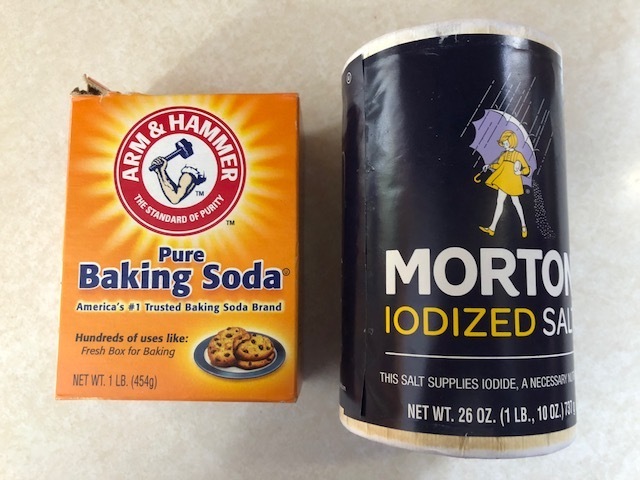 Items that may be displayed include a container of lye (sodium hydroxide), a box of washing soda (sodium carbonate), a box of baking soda (sodium bicarbonate), and a bag of rock salt (unrefined sodium chloride) (see figure 1). Sodium is an exceptionally soft metal. Students will likely have no experience with a metal that is so soft. We show the class that pellets of sodium are flattened by a gentle blow from a hammer and may be cut with a knife. To do so, we use one small pellet of sodium. First, we wipe off the protective oil with a dry paper towel or tissue (see figure 2). The sodium pellet is tapped with a hammer and then cut with a butter knife to emphasize how soft it is. While we do not show that sodium is conductive, we note that being a metal, it conducts electricity. These experiments must necessarily be conducted on a small scale and video projection will be very helpful at making a small demonstration look bigger. We show the class that the sodium reacts with oxygen in the air to tarnish (oxidize) at once. A freshly cut surface is bright and shiny for only a few seconds (see video 1). We note that the sodium in the stock bottle is stored under oil (figure 2). Why is that the case? Next we show that sodium metal reacts with water (video 1). We add one of the pieces cut previously to a glass crystallizing dish or petri dish containing water. While the reaction is occurring, we ask the class to not only watch but to listen to the reaction. We note that the reaction product is basic and add a few drops of phenolphthalein solution to the dish. Usually the students are eager that we repeat the demonstration using the other half of the sodium pellet. We could not show the reaction between solid sodium and chlorine gas in the lab safely, but video of the reaction is readily available (video 2) and can be shown to students. Students are generally interested to discuss and compare the properties of these reactants that produce something they ingest daily. Lastly, we note that a laboratory test for sodium is its characteristic yellow flame color and demonstrate the flame test (video 3). For those with gas stoves at home, it is sodium that is responsible for those flashes of yellow flame while cooking. 1. Chemical magic is stage magic that uses chemical reactions to produce a desired theatrical effect and entertain an audience. One of the most accomplished performers was Dr. Hubert N. Alyea of Princeton University and a former editor of the Journal of Chemical Education. See, for example: (a) Lippy, John D. Jr. Chemical Magic; A. L. Burt Co.: New York, 1930 (b) Ford, Leonard A. Chemical Magic, 2nd ed. ; Dover: Mineola, NY, 1993 (c) Chen, Philip S. Entertaining and Educational Chemical Demonstrations; Chemical Elements Publishing Co.: Camarillo, CA, 1974. In this case, a series of chemical magic experiments are presented to the students to captivate their interest and to leave them questioning their assumptions about what they observed.